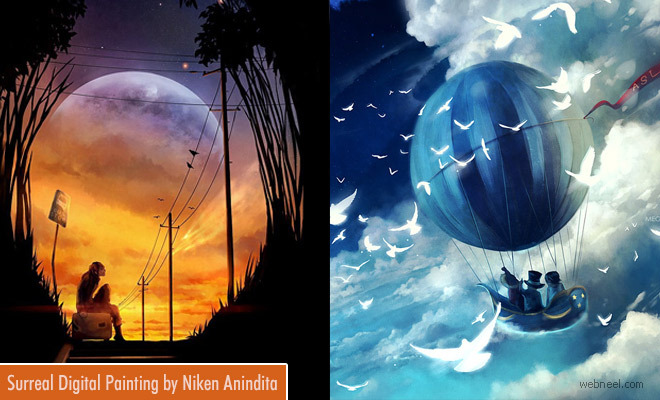 Digital Painting: Niken Anindita is a digital artist, illustrator and painter from Indonesia. She is popularly known as Megatruh in the social medial and art communities. She does book cover illustrations, surreal digital paintings, digital art for commission. Most of the time she uses blue background and people trying to gaze at the galaxy of stars. Dreams of watching the galaxies meet while lying down on ice floats with your favourite pet is super crazy. Hunting in the forest on the back of a white direwolf, super scary. The long wait, a girl sitting on top of her suitcase and waiting at the starting of the tunnel, with the moon as a backdrop is so beautiful. You can feel the emotions oozing out of the digital art and we simply love her work. Let us applaud her work by visiting her page.